We extend an extravagant welcome to you to worship with us every single Sunday. We worship at 9 am and 11 am from October through April. Please check the home page for specific worship times as they do change occasionally. 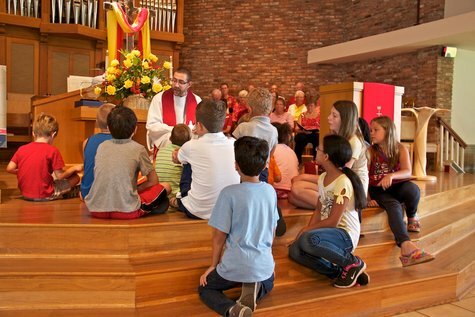 Families tend to worship at the 9 am worship service…although everyone is always welcome at all services. In the summer, we worship at 10:30 am. We also offer a Summer Breeze service at 8:45 am. We want you to feel warmly welcome at First Congregational United Church of Christ. We prayerful seek to worship in ways that are meaningful. You can expect to find people dressed comfortably to those who wear ties. You can expect to find people from all walks of life and a celebration of diversity. You can expect to find a centering of our hearts around Scripture…and beautiful music. 4:00 pm. A celebration of poetry and communion. 7:00 pm. Family service. It includes a children’s service and the lighting of candles. 11:00 pm. It includes communion and the lighting of candles at midnight. A simple service is held at noon in the chapel and at 6:30 pm in the sanctuary as the start of the Lenten season – a time of preparation for the coming Easter. On the Thursday Evening of Holy Week,we hold a service. Time and location varies, but Holy Communion is always central to the service. At noon on Good Friday we remember Christ’s death upon the cross with a one-hour service that is poignant and solemn. This service is important to the participants in fully understanding the joyful message of Easter. 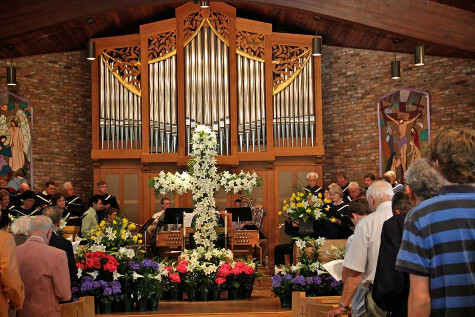 Easter is celebrated with combined choirs, brass ensemble and a sanctuary decorated with lilies and spring flowers.